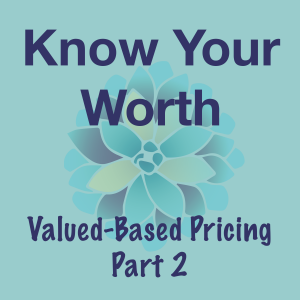 This is the second of a three-part blog series about value-based pricing for financial coaches. For the first part of this series, Ditch Your Hourly Rate, click here. Ready to dive in? Good. I have a quick exercise for you. It requires nothing more than a piece of paper and a pen. Or you can download our worksheet here. For inspiration, reflect on your own financial progress and the results you have experienced. Or if you already have coaching clients, think about your most successful client and what you were able to do for them. There is no limit here. This circle can include five things or so many that you are cramming them in. Let your mind wander and really hone in on the ways you help your clients achieve results and positive outcomes. When you’re done filling in the first circle, draw a second one around it (your paper might look like a giant donut right now). 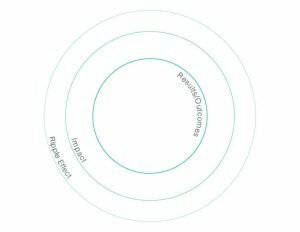 In this circle, you’ll write all of the ways the results you wrote in the first circle positively impact your client’s life. So if you wrote helping someone become debt free in the first circle, you write less stress in the second one. If you wrote have more money in savings, you can put security in the second circle. I want you to really be able to see the positive value you add to your clients’ lives. Yes, it’s great to pay off debt, but what positive impact can a person feel when they have less debt? They can feel peace, clarity, and self-worth. Similarly, they might start sleeping better. Their relationship with their spouse may improve. There are so many emotions that are tied to our finances, so when we help our clients gain financial clarity, they feel it in other areas of their life. So go ahead and write out all of the positive impacts you can think of in this second, bigger circle. We focused on the immediate impact – now let’s think long term. When we think long term, that’s when things really get fun. One of the many wonderful things about being a financial coach is getting to see an immediate positive impact on a client’s life. When I first start working with a client, almost immediately they begin having small wins. Those wins might lead to them gaining clarity or having a better relationship with their spouse, and that might happen right away. But when we focus on what kind of impact those changes will have over time, that’s when I see my real value most clearly. After I work with someone for four months, I usually notice a big shift in their mindset. My clients start to dream big. They see possibilities they previously thought were out of reach. Their pipe dreams start to look like real, achievable dreams. And that is the biggest value of financial coaching: it is a short-term investment with lifelong returns. So think about those lifelong returns and write those in the ripples. Pretty amazing right? Those ripples are the reason I love being a financial coach. We have the ability to change the course of peoples’ lives for the better. Hopefully, you found this exercise meaningful. The service you provide is important. And now that you know your value, the next step is being able to communicate it in a sales setting. That’s part three of this blog series. Stay tuned.